With the onset of the lovely cools of September and October, and the practiced hand of the summer gardener, it is the perfect time for perennial division. By rights, we should be doing this twice a year; plants that flower in the spring and early summer should be divided in the fall, and plants that flower in summer and fall should be divided in the early spring. By dividing our perennials, it not only provides multiple new plants, it benefits the plant by increasing the root strength, thus producing more blooms, as the division in essence creates multiple young plants with room to spread. In fact, when you see one of your plants growing into the space allotted for another plant, that is an indication that the former needs to be divided. It is best to divide prior to a plant showing signs of needing it; when it looks its best, the end of that year is the optimum time to divide. If the center of the plant has grown weakly leggy, and sports fewer flowers and smaller leaves, it is definitely time to rejuvenate and divide! 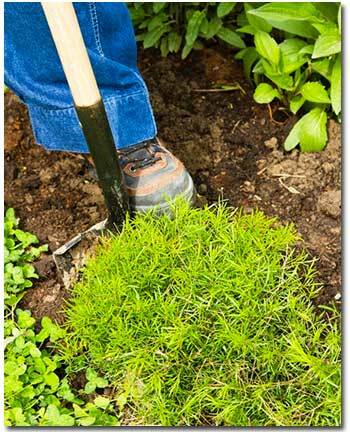 Angle your spade or shovel at a 45 degree angle at the drip line, and cut down and under the clump from various points around the outer edge until you are able to lift the plant out of the hole. Digging this far out from the center of the plant ensures that you will be lifting with most of the roots intact. Wash the extraneous soil from the roots for easy determination as to where to divide. Remove any sections that look dead, damaged or diseased, and trim back to healthy white tissue. Eroded crowns and discolored stems should be discarded. If you plan on giving away some of the divided plants, have containers with fresh, amended soil at hand. It is best to have surveyed your garden and pre-determined where the new plants will go, keeping in mind that each garden denizen will grow, thus is in need of plenty of spacing between plants. If you haven’t the time to complete the project all at once, put the divisions that you haven’t yet re-planted in a bucket, cover with a wet newspaper, and store in a cool place such as the garage. If, while on hold, the divisions dry out, soak in full water for about an hour and then get them into the earth! Any earth in your garden that used to contain the removed plant should be filled with fresh amended soil so that its new occupants will enjoy good drainage and air circulation. When dividing the first of these, the clump or offset root system, snap the connection between any of the sections to obtain a piece with ample roots and three or more growing “eyes.” Denser clumps may be cut apart. Surface roots are those that run just below the soil line, and form new crowns when they reach an open space and then make contact once again with the soil. To divide these, simply cut between any of the stems with a sharp pruner, or a sharp knife. Plants with taproots should be divided with a sharp knife; make a slice down the length of the root, maintaining at least one eye, some taproot, and some side roots. For a perennial with underground running roots, dig up the primary plant and cut away any eyes or sucker that may be forming. And finally, perennials with woody roots often form new roots when stems rest on the ground, or are covered with much. Simply cut between the rooted stem and the mother plant. Remember to place all new divisions into holes at least as wide as the root base is when spread out; gravity works in the plant’s behalf by sending chemicals flowing downward from the tips of leafy stems to the roots. Listed below are a few perennials that are ideal for Southern California plant division.